This red printed shrug is front open. The colors are subtle and class apart. A statement shrug are a way to be one step ahead of the party fashion game! Keep in style this season and shine like a star! The added feature of thuis shrug is the solid shawl collar. This classic trend is back and there is no better way to bring out the sassy attitude in you. Wear your classic black tune and fitted denims with some light earrings and spike embellished rockstar boots. Polyester can be easily machine washed with careful handling. It is water resistant, to retain that property use a mild detergent. Wash the garment inside out. When using machine drying, keep the settings at the lowest. Always dry under shade or inside out (goes for your entire wardrobe, not just our clothing). 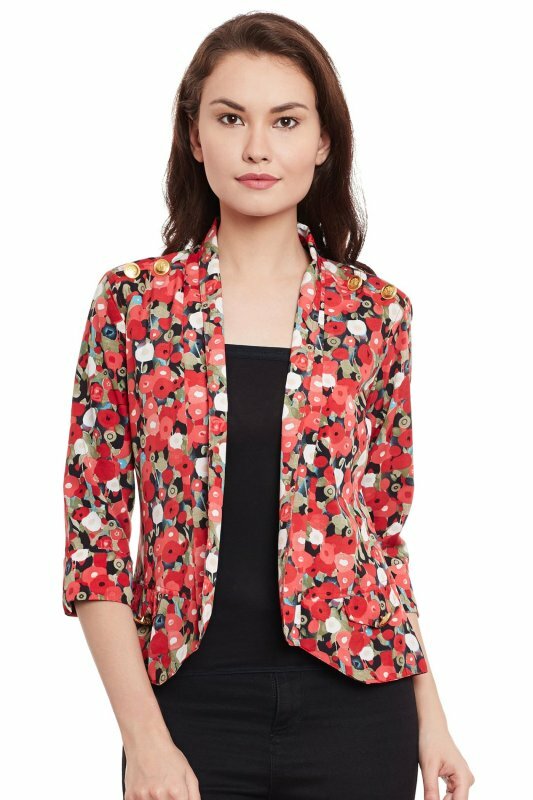 Unbelievable price on Red floarl print summer jacket in Gurgaon (India) company THE VANCA.